I've been waiting with bated breath since last March. Lisettes weekend is finally here, and by Sunday evening, I'll have my own stash. Can't wait to tell you/show more about it, although the actual recipe will not be forthcoming, as stated previously. 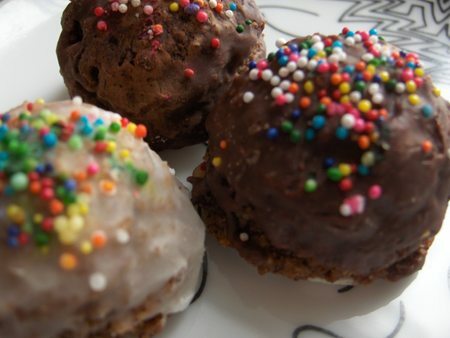 There are similar things from other sources: I have a feeling that this, for example, may bear at least some small resemblance to the beloved tiny nut torte of my childhood. In addition, I'm making another rather fabulous nut-based confection today, which will be shared with you sooner rather than later, recipe and all. I just can't disclose this one quite yet, both because I haven't made it yet and there are no pictures, as well as for another reason which will be made clear in due time. But I assure you that it: a) is something gorgeous, which deserves its own post, b) can grace your (or someone else's) holiday dessert table and elicit many ooohs and ahhhs, and c) will be given to you in its entirety. 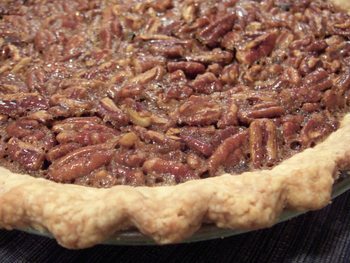 And further below a new invention, Espresso-Maple Pecan Pie, inspired by other bloggers and recipes, as well as being something I particularly thought my brother would like. And so we come to the heart of our Thanksgiving heartbreak -- late last night, my poor brother called me to say that he's horribly sick with a bad cold, had stayed in bed all day trying to beat it, but was pretty sure they would not come to Thanksgiving dinner for fear of infecting my rather frail and elderly father. Despite cheerful blog-rhetoric that might lead one to think that pie-anxiety is my biggest problem, it's been a very difficult week -- couple of weeks, in fact. G is the one person who's kept me sane in a morass of work, school and family-related stress. 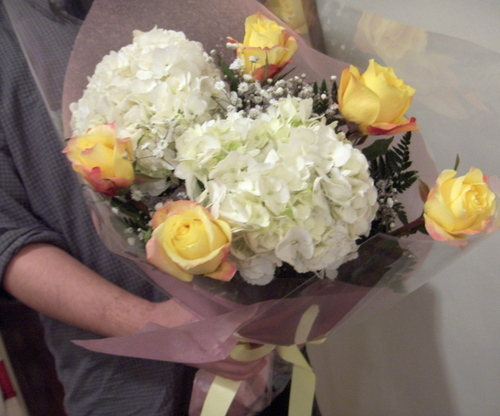 I won't go into details, but suffice it to say that about half an hour ago my husband came home with these in his arms. For me. Why? Just because, he said. Just because you've been having a rough patch lately. Just because I love you. Sure. Of course I burst into tears -- what then? Well, then he ran out to pick up the dry-cleaning before the shop closed. Yes, I know. And I guess I just thought the rest of the world should know as well. Help me. I feel that I need a Twelve-Step program specifically geared to people who simply cannot keep themselves from making too many pies at Thanksgiving. I don't have a huge crowd of eaters gathering at my father's table this year, so I don't really have any good excuse to make the five or so pies that I'm dreaming of for Thursday's dinner. Five pies for six eaters seems slightly excessive, right? I'd like to say that we have eight coming to Thanksgiving, as that would give me more leeway. Considering that the five-month-old twins will be dining on (organic) formula and rice cereal, I'm not sure I can get away with that one. I know it just sort of looks like a study in brown, with fluffy clouds on top, but above is a plate showing samples of the three pies I made for Thanksgiving 2006 (and Thanksgiving 2005, and 2004, and so on), back to front: Souffléd Pumpkin Cognac Pie, Pure Maple Pecan Pie, and Toffee Apple Crumble Pie. They are all more or less my own inventions, and yes, I've been making them for years. This year I'm chafing at tradition a little, and have a nudging little feeling of wanting something new. 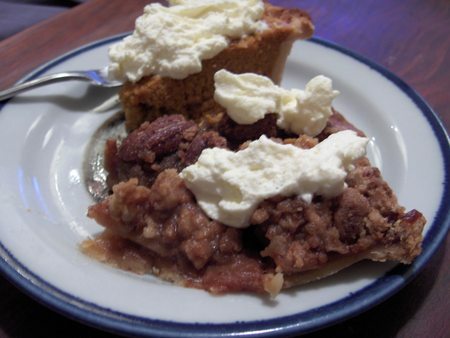 But my brother loves that maple-pecan, and my sister-in-law craves pumpkin, and G and my dad both want apple. The rest of Thanksgiving dinner presents no turmoil for me. 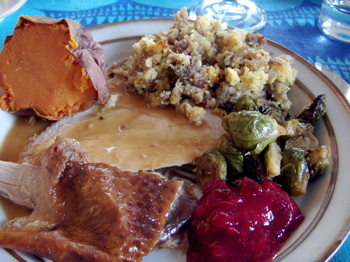 I'm very happy to go with our tried-and-true menu of favorites: the crisp-skinned turkey, its gravy made from pan drippings and turkey broth, cornbread and sausage stuffing, cranberries made the way my mother always made them. I look forward to these things, and so do my family members. I might hesitate slightly between plain baked yams, and a lovely sweet potato purée, or whether or not to dress up the brussels sprouts in a new way. But for the most part, the savory menu is set. I'm really struggling with the sweet table, however. I've been railing against the old favorites in my mind, and looking at new possibilities: A chocolate-espresso pecan pie featured in Fine Cooking magazine. Deb's (and well, The New York Times') gorgeous nutmeg-maple cream pie. The idea of pumpkin cheesecake laced with cognac and bedded in a ginger-pecan crust caught my fancy for a while -- I'd made one some years ago for a holiday party, and always wanted to make one again. But I always cave in to the traditionalists in my family, who want the same old, same old. Even the apple pie presents some conflict -- both G and my father love apple pie best for Thanksgiving dessert, so there's certainly going to be one. At least one. But what kind? My dad wants the two-crust traditional, and while my husband loves that too, I think in his heart of hearts he really wants the crumble-topped kind. 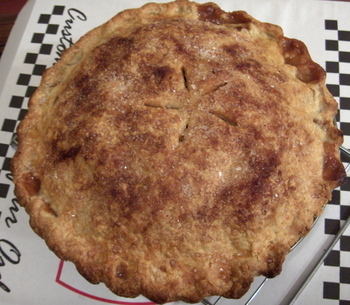 I swear to you that I'm fairly well tempted to make two apple pies...along with everything else. According to the internets (aka your favorite fount of knowledge and mine), it was Adam Smith who said, "The propensity to truck, barter and exchange one thing for another is common to all men, and to be found in no other race of animals." Well, I'm here to tell you, it's pretty common to women, too. I've struck up a bargain with another person of the female persuasion, and it's all been pretty brilliant thus far, despite a fork or two in the road. Fork, yes, ha ha. Because this bargain does involve cooking, indeed it does. It all started a month or so ago, when I went to my friend Andrea's birthday party and met her friend Deanna. For quite some time, Andrea's been telling me that Deanna was going to move in on my street -- she and her husband Mark had bought a brownstone in the next block, which was in the process of being renovated for them and their three kids. Deanna and I hit it off -- especially when we figured out that I'm a cook always in search of an audience, and that she'd rather undergo waterboarding than cook. She, however, is brilliant at space and organization, being both the daughter and the sister of architects. She's, like, genetically programmed to think spatially and design-wise, while (G and) I tend to live the packratty sort of life of a pair of overage hippie/student/slum dweller with...let's just say I'm not a paragon of the organized and ordered life, nor (yet) a person who makes excellent use of the space she has. But the thing is, I want to be. I am, in general, much happier when I'm living in a reasonably well-organized and clean-feeling space. I was actually much better at it when I was a college student, when all I had was a trim little dorm room with a limited number of possessions. It's my own dreadful accumulation of books and papers and clothes as well as another packratty person and all his stuff that's made our apartment into the stacks and piles of hell that it is today. Although frankly, that's my perspective. People actually love coming over here, and don't seem to think it's that bad at all. But I just want to get really organized. And Deanna, see, Deanna is so good at helping people organize and re-think their space that she actually has a business based on that very principle. Before she and her family moved into their new home, they lived for years in less than 1000 square feet. Five of them. And everyone used to come over and comment on how spacious their apartment was. Are you beginning to understand how much I need this new neighbor of mine, this savior who can help me with a less-than-1000-square-feet apartment where two people are feeling kinda cramped? When Deanna found out that a) I cook and b) I'm on sabbatical, she actually wanted to hire me to do some occasional cooking for her family. But I didn't want to do that, not with a new neighbor/friend-of-a-friend/new friend. Once I found out that she's a spatial genius, we realized that our barter/match had been made. Once a week or so, I cook up a big batch of something -- soup, curry, chili -- that meets her family's dining specifications. And once a week or so, Deanna comes over and makes me throw things away. That's where we've started, because we can't do much to change the space until we throw out about half of what we own. Deanna has rules, see, she's pretty strict. We got rid of about a bajillion pieces of clothing I had hanging on hooks on the closet door, and she told me I could hang up one thing on that door. One thing. One. G just about bust a gut. "Whaddya mean, DeANNA says you can't hang anything else up on that door?" I tried to explain to him that it's not enough to just get rid of stuff. In order to stop living in clutter, you have to stop accumulating and cluttering up all your free spaces. He raised an eyebrow. Later that night, he asked me if I wanted him to throw away a paper bag, the sort that I sometimes hoard for ripening fruit. "Or maybe I should take it down the street and ask DeANNA," he said sardonically. "No," I replied, very seriously. "We don't need to do that. It's almost always okay, you see, to throw things out. We might have to ask her about keeping things, though." He expelled that sort of now I'm being very patient with you breath, and we went on with our evening. And my part of the bargain? The cooking? Yes, yes, I'm getting to that. You see, at first I'd thought this would be easy. I figured I'd just cook an extra big batch of whatever I was making for us that week, and do the hand-off to Deanna's family. Not so simple. As you're probably aware, we're dedicated carnivores in this household (I'm actually under doctor's orders to eat between 70 and 90 grams of protein a day, and trust me, you really need to eat animals to do that, unless you want balancing your proteins to become your full-time job. G is simply the sort of meatasaurus who feels that the vegetarian life, like the unexamined life, is not worth living). Deanna's family, however, are vegetarians. They eat fish, but we don't yet have a great or even good source for fish in our neighborhood. So I began to think about dishes that I could cook in large batch to which I would either add meat for us, use as vegetable sides to our meat-based mains, or even eat sans animal flesh, since I probably wouldn't keel over from amino acid deficiency if we did that once in a while. And then, at some point during our first neighborhood walk to the farmers' market, Deanna told me that her oldest son is very, very lactose intolerant. Oh. So no squash or potato gratins with cheese or pastas with dairy-based sauces for protein. Okay then. 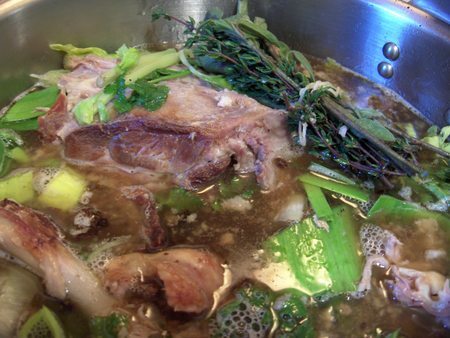 My first move was to make a big batch of this soup, with the vegetable stock option. The soup is flavorful but gentle and very kid-friendly, which was perfect to start with, until I could see how spicy/exotic they're willing to go. And those who could tolerate it could have grated cheese on top, which this soup loves. Deanna emailed me to tell me the soup had been a big hit with kids and adults alike. But then new information surfaced. Her email continued. "Oh, by the way, Mark's gluten-sensitive. He's not celiac or allergic, he just has a level of intolerance. 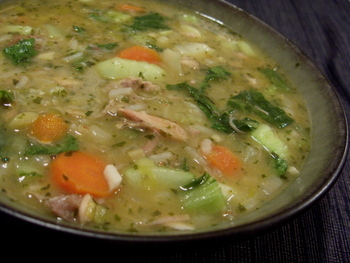 He ate the soup [which had wheat-based orzo in it], and loved it, didn't get sick or anything. But yeah, I know we're a tough crowd. Maybe that's why I don't like cooking for my family." Gee, ya think? "We do eat fish and eggs and nuts. And tofu. I know, I know, I'm reaching here." Anyone who has a sense of humor about themselves AND can walk into my closet without a weapon of mass destruction, telling me that she's seen far worse, is okay in my book. Even if it means stocking up on the brown rice pasta at Trader Joe's. I shot back an email that just said "Hmmm. No homemade lasagna for YOU." But hey, I'll cook for them any day. And so I have been. Week one was the soup -- which we ate ourselves, with no modifications other than some bread and cheese on the side. Yes, we find ourselves capable of an (ovo-lacto) vegetarian meal on occasion. It's all good, as long as within the span of each week I'm getting a fair amount of high quality protein. Week two I made an aromatic vegetable curry with carrots and cabbage and potatoes and peas in a creamy pottage of red lentils, coconut milk and spices. I handed off half of it to Deanna's family, to eat with rice and yogurt, and we had ours the same way, alongside an abstemious but lushly spiced skinless breast of Chicken Tikka ala Nigella Lawson. 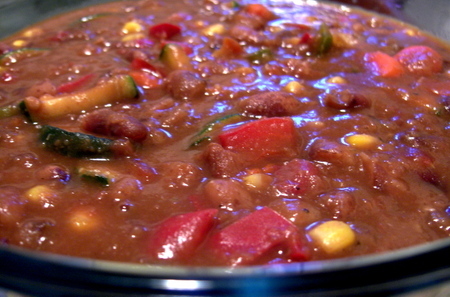 Yesterday I made a huge pot of chili with lots of freshly cooked beans and vegetables and savory seasonings. 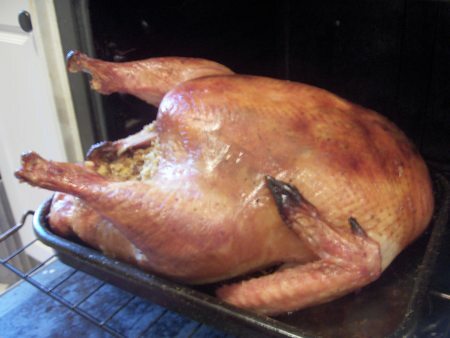 I ladled out a pristinely meatless tureenful and containered it for its trip down the street. Then I browned meat, added it to what was left and made our dinner -- since G doesn't think that chili without meat is actually chili. I made two batches of cornbread -- ours, with just a bit of bacon dripping, and the one for down-the-street, with canola oil. Fortunately, my cornbread is naturally gluten-free, since I never use white flour, just stone-ground cornmeal -- and it still bakes up light and fluffy (and corny and crunchy and grainy-sweet -- but we'll save that for another post). The upside of cooking this way is that G and I have been eating dishes that are absolutely loaded with assorted good vegetables, so I don't worry at all about us getting our five-a-day -- more like 10-a-day at this rate -- nor do I feel guilty if I'm too tired to make a salad to go with our meal. Neither my new buddy nor I are going to change overnight. Recently I emailed her to say that sadly, I didn't think I would get to do some preliminary clearing out before she came over, but since I'll always cook even when I won't do anything else, I was in the middle of making the vegetable curry for us all. She emailed me back to say that sadly, she hadn't done a thing about food for her family recently -- but she'd re-organized her library and cleaned out her files. She's kind of like the yin to my yang: when her hungry, growing sons and daughter ask what's for dinner, she's filled with the same sense of panic and helplessness and horror that I feel when I survey our clutter-filled back bedroom. Last time she was here, she gave me homework. I have to clear out my bed and bath linen drawers before she comes back, since I have all these lovely new things that were wedding gifts, and we have nowhere to put them. But I've pretty much decided I'm going to give her homework, too. Someday soon, there's going to be a list on her refrigerator, showing suggestions for different dinners each day of the week, adequately protein-balanced and made with pantry staples that can always be on hand. She doesn't know it yet, but Deanna's going on meal rotation. This is great for an evening when you're having a big bunch of people over, and you're feeding vegetarians and meat-eaters alike. For this batch, I deliberately kept it pretty mildly spiced, since it has to be kid-friendly. One of Deanna's children is fond of spicy food, and the others are not so sure, so hot sauce and extra spices can be added to taste. You should certainly boost the spice levels to your own liking -- and a few chiles in adobo certainly wouldn't go amiss, for those who like that kind of thing. This makes between 12 and 20 servings of chili, depending on what else you serve with it -- but the recipe can easily be halved. It's excellent with cornbread, over rice, and topped with all the usual suspects -- good aged cheddar or jack cheese, sour cream/yogurt, chopped green onions and whatever else you like on chili. Cook beans in their soaking water (as per Rancho Gordo instructions). They should be covered by at least an inch of water at all times. As they're simmering, chop up carrots, garlic and onions and add them to the pot. Add the bay leaf, cumin, cinnamon, oregano, chili powder and coffee. Simmer the beans until tender and toothsome, anywhere from 1 to 3 hours, depending on size, type, age, etc. Add water as needed, especially if the beans start to look like they're absorbing everything that's in the pot. When the beans are almost done, add salt and pepper, tomatoes, and sweet corn. Let the beans absorb a spoonful or so of salt, and then taste to see if they need more. Sauté the peppers and zucchini in a splash of olive oil in a skillet, and add to the pot of beans. Simmer everything together for another 20 minutes or so, until the beans are creamy and soft, and the flavors are mingling and coming together. Add more spices to taste. Ladle off half the batch of chili for vegetarians, and place in a separate pot. In another skillet, brown both kinds of ground meat in batches. [For my normal carnivore's chili, I prefer stewing meat or tougher cuts that have been chopped coarsely by hand, because the meat simmers a long time with beans and vegetables, and has a chance to become tender. In this case, I used ground meats since they are added more toward the end of the chili's cooking time.] Add the well-browned meat to the remaining chili in the pot, and simmer for another 20 minutes, until the chili is infused with meaty flavor. Check for seasoning, and serve as above -- with cornbread, or rice, and a range of chili condiments. Having a big batch is good -- both versions get better the second, third and even fourth days of their little lives, and they also freeze very, very well.